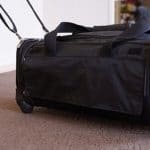 Sherpa On Wheels Pet Carrier Review: Should You Invest in It? Recently, pet carriers on wheels have become very popular. These carriers are very easy to carry and don’t need much effort. You can carry these pet carriers on wheels to wherever you want easily. That’s why they are getting more popular each day. Many companies have started producing high-quality pet carrier on wheels for their increasing demand. Sherpa is one of them. Their pet On wheel pet carrier is getting much hype these days. In this article, I’ll give you a detailed review on Sherpa on wheels pet carrier and lastly, I’ll reveal my opinion if you should invest in it. So, let’s get started! According to the manufacturer, this on wheel pet carrier will let you travel with your cat with peace in mind. Traveling with cats can be pretty stressful for both you and your cat. Moreover, if you need to constantly check over your cat to see if she is doing okay, then you can’t enjoy the trip at all. Sherpa understands this. And that’s why they manufactured this on wheels pet carrier to remove all these tensions from you. Sherpa on wheels pet carrier ensures total security and comfort of your cat when you are traveling. For quite some time now, Sherpa has become one of the most widely recognized brands for producing premium quality soft-sided cat carriers. They are the first one to combine fashion, style, trend, and quality in a cat carrier. Moreover, Sherpa on wheels carriers come with a 1-year limited warranty. So, even if you are not satisfied with the quality of the product, you can return it immediately. The most enticing feature of this carrier is its Guarantee-On-Board promise. You may not have heard of this guarantee-on-board promise before. 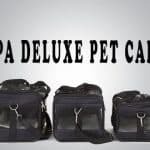 Let me tell you, this feature is what differentiates Sherpa on wheels pet carrier from all the pet carriers in the market. “Guarantee-On-Promise” is a feature from the Manufacturer that guarantees that this carrier is compliant with all major US airline rules and regulations and you can travel by plane with your cat in this carrier without any kind of hassle. The small and medium size of the carrier is compliant with most major US airlines. So, you don’t have to get an extra airline approved pet carrier for traveling by plane. To get the “Guarantee-on-board” paper, all you need to do is visit the official website and provide some information such as carrier size, flight, pet information etc. then you shall be presented with a Guarantee on Board form. You can print the form and provide it to the gate agent at the airport. If you are denied to carry the carrier on the flight, then Sherpa will bear all cost of the flight as well as the pet fee. This is an incredible offer that makes this carrier legitimate. Visit here for more information on this. Sherpa on wheels pet carrier has castor wheels installed on them. These wheels make the motion of this carrier very smooth and free from any noise. This is great for cats who are a bit skittish as smoother ride ensures less stress for your cat. This carrier includes an eye-catching pet on board flag which increases the visibility of the carrier. it is very easy to confuse your pet carrier with thousand other luggage inside the airport. So, a flag like this will make the carrier stand out in a crowd of hundreds of luggage. It will also make people aware that the carrier contains a live animal. It is very important for your cat’s safety. Sherpa on wheels pet carrier provides multiple mounting features for you to carry your cat. The carrier has padded straps for carrying it by hand. However, if you don’t want to carry your cat all the way long, you can use the castor wheels to roll the carrier with you. There is another way of taking the carrier with you i.e. by using the padded shoulder strap. With these amount of options, you will never feel tired carrying your cat. It is very important for an airline approved carrier to fit under the plane seat. Sherpa on wheels pet carrier has a flexible structure which allows it to fit under most airplane’s seat. The carrier has an internal spring wire frame which provides this flexibility to the carrier. You can fit the carrier under the airplane seat without even deforming it in any manner. The carrier has four ventilation panels on each side. These meshed ventilation panels ensure proper air circulation through the carrier which is very important for an airline approved cat carrier. it also makes the carrier comfortable for your cat. Another benefit of having meshed panels on all side is, your cat can enjoy the outside view with you. She will also be able to see you constantly which will make her less stressful. Moreover, you’ll be able to keep an eye on her constantly too! The carrier can carry pets for up to 19 inches length and 9.5 inches height. It also has a weight capacity of 22 pounds. So, you can easily carry small to medium sized cats in this carrier. The carrier offers multiple entries to enter your cat inside the carrier such as top and side entry. It makes getting your cat into the carrier very easy and less stressful for the cat. You can also have a quick access to your cat in an emergency. The entries are secured with locking zippers so, you don’t have to worry about your cat’s security. The carrier can be maintained very easily without spending much time. You can quickly spot clean it by wiping with a clean piece of cloth. The carrier is lined with a faux lamb’s wool liner which makes it very luxurious for the cat. Moreover, the liner is machine washable so you don’t have to clean it manually. The dimension of the carrier is 20 x 12.25 x 10.5 inches. I really love that this carrier comes with a guarantee-on-board promise. Even if I get rejected by the airline, the company will bear my whole cost. It makes them very trustworthy and confident about their product. The carrier has multiple mounting systems which are necessary for the owner. Carrying the carrier in only one way seems boring and sometimes it’s not possible. That’s why multiple ways to carry the pet carrier is a pretty good feature. You can either roll the carrier, carry it by hand or use the adjustable shoulder strap. Sherpa on wheels pet carrier has multiple entries to enter your cat. It comes in real handy when you have a skittish cat. Cats that become nervous easily are very hard to get into the carrier. in such cases, carriers with top loading feature help a lot. It also provides quick access to your cat. The interior of the carrier is lined with washable lamb’s wool liner which creates a comfortable environment for the cat. The liner is also machine washable. So, you don’t need to clean it manually. The carrier has an internal spring frame structure which makes it easy to fit under most airplane’s seats without even deforming it. The castor wheels are recessed so they don’t make any noise when in motion. Also, these wheels help to make a smooth motion for your cat. Another very important feature of this carrier is its four side meshed ventilation panels. These panels ensure your cat will get sufficient air inside the carrier. They also provide four side visibility of the outer environment to the cat. Your cat can also see you all the time through these panels. Another thing that I really love about this carrier is its pet on board flag. It not only makes the carrier visible but also keeps your pet safe from other people. People tend to be extra careful about the carrier when there is a live animal inside. It is approved by most of the major US airlines. Some customers complained that they didn’t get the pet on board flag with the package. it is not cool if you advertise something and later on not deliver it. People at Sherpa should be more careful about this types of mistakes. In a most newer model of aircrafts where the entertainment monitor is placed in the headrest, the carrier might not fit properly under the seat. So you need to check on with the airline beforehand to ensure if it does fit or not. Surely, the carrier has some flaws in its design and it is not free from certain limitations. But, I have found it provides the most value for money among many other pet carriers on wheel in the market. I am not denying that it costs a bit much than most other pet carriers, but you get what you pay for. When it comes to quality product, no other company is in parallel to Sherpa. They also have gained the trust and goodwill of millions of customers worldwide. So, if you ask me which pet carrier on wheel will be best for your cat, I will surely put my money on Sherpa on wheels pet carrier. if you are planning a journey by plane with your cat, I definitely think you should give this carrier a try. Click here to check the current price of this pet carrier on Amazon. Sherpa Deluxe Pet Carrier- Trustworthy Carrier for Your Cat! 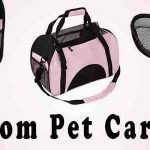 Pettom Pet Carrier (Cats Love It)!